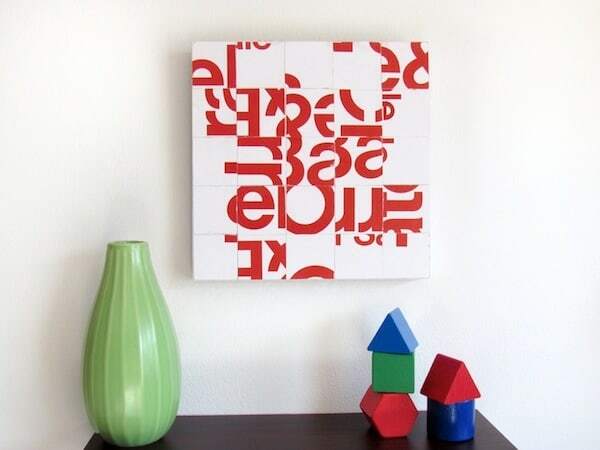 Use junk mail to create unique typography recycled art. 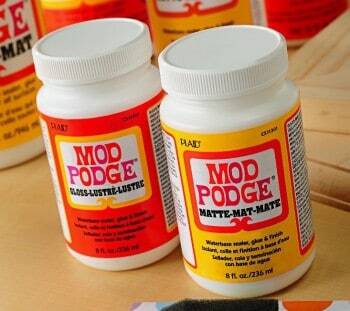 All you need is a few basic supplies and Mod Podge – and some creativity! Do you get a lot of junk mail? 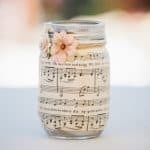 Use it to make this unique recycled art! My favorite retailer sends me many catalogs and sale mailers. I must say, I always get excited when a Crate and Barrel catalog arrives. I get a lot of inspiration from looking through them and the quality of the paper is great for decoupaging, especially the CB2 catalog! 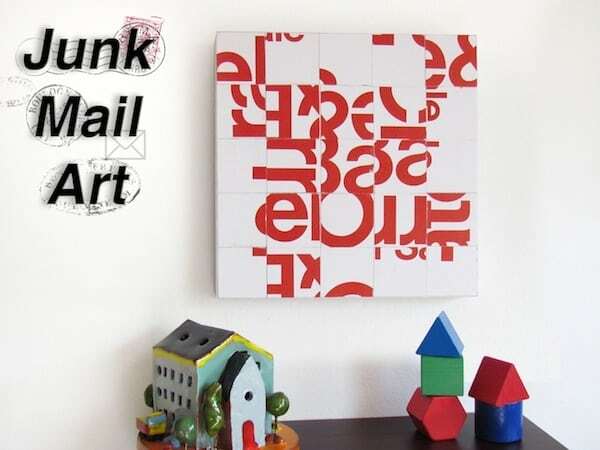 I made this AWESOME re-arranged typography wall art with two junk mail postcard sale mailers. 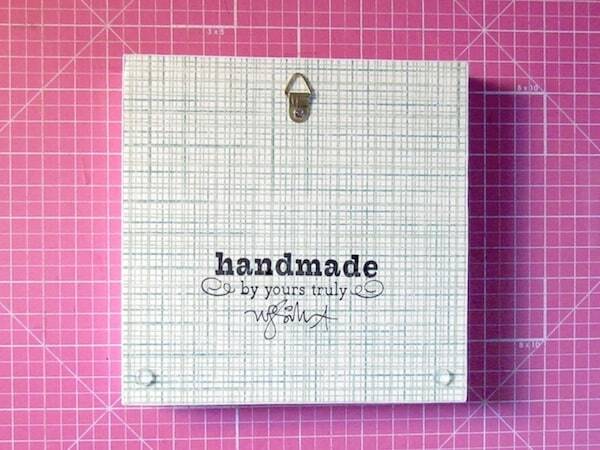 This is what you need to make this junk mail wall art plaque. This tutorial will showcase each step I took to complete this art piece. 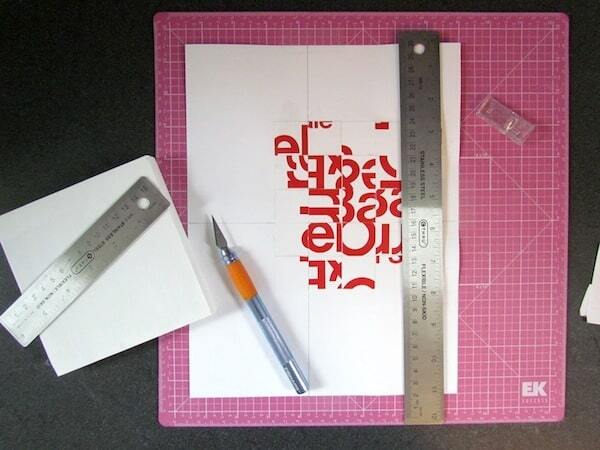 Step One: Cut 25 pieces (1″ squares) of the red and white section only. Step Two: *TIP: I taped a piece of cardstock to my cutting mat. This type of mat has measurements printed on it, so it is easy to make accurate lines (see photo). I made two straight lines: one vertical and one horizontal. This made my layout easy to place. I knew I needed 5 rows of 1″ squares across since I was working with a 5″ x 5″ block. I used Mod Podge Paper to mount the squares in place . . . then let dry for 15 minutes. 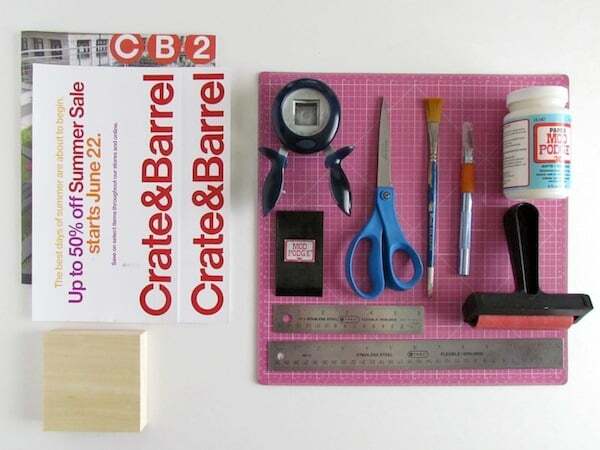 Then, I cut the mounted pieces at 5″ x 5″. 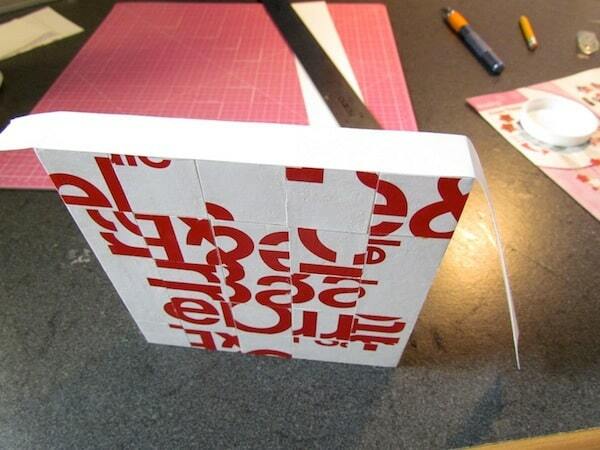 Step Three: Decoupage the FRONT with the re-arranged 1″ square blocks. *TIP: I used a brayer that had some dried Mod Podge from previous projects, because when I run it over the paper it will give it a aged, rustic look and scuff it up. 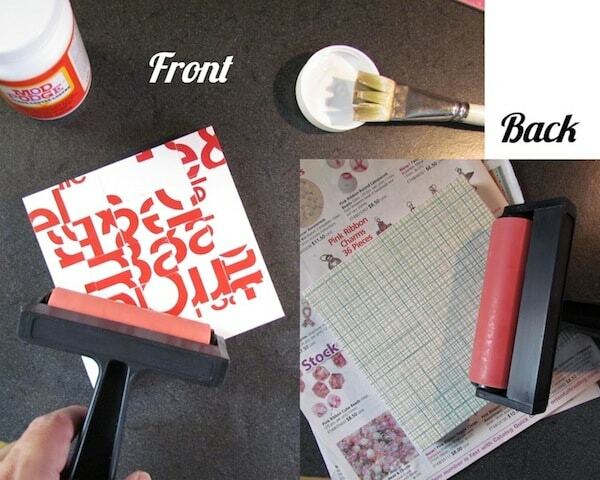 If you don't want that look, use a clean brayer. Next, I decoupaged the back with a random piece of printed cardstock. 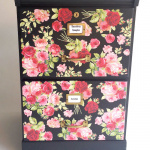 Step Four: I decoupaged the sides with 3/4″ white cardstock. Step Five: Attach hanging hardware to the back. TIP: I find for something small like this a triangle hanger is easiest! All, you do is find the center, mark it with an AWL, then insert a screw. . . Then I attached two bumpers to the bottom. 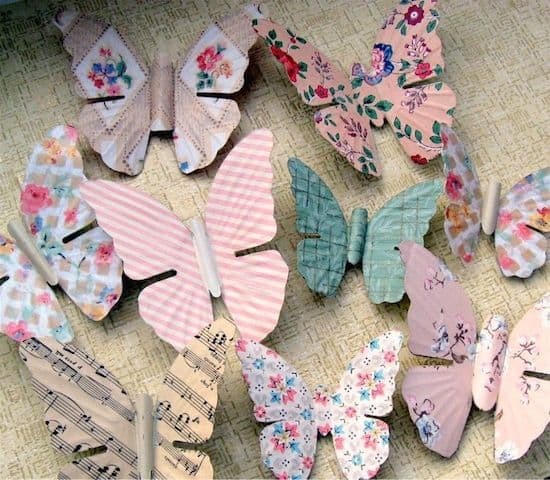 Your recycled art project is ready to hang and just think – you didn't spend that much for it! Wouldn't it be fun to try this on a huge scale? Don't forget to visit the other Man Podger projects! That’s so cool! 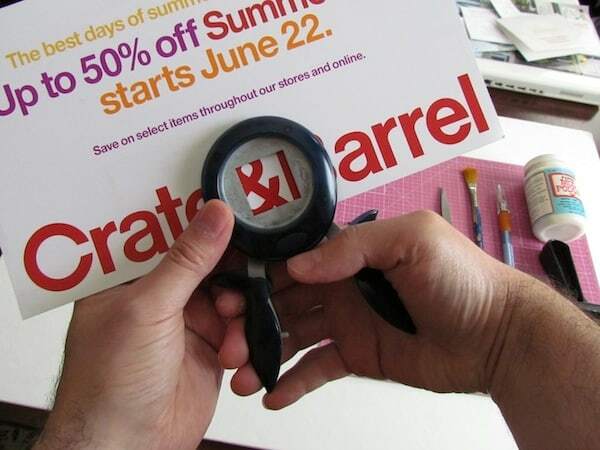 Is it sad that I knew that was Crate & Barrel right away? I’m too familiar with that store! LOL! Great project! Love this! 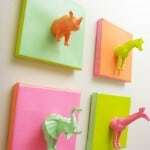 Added a link to my Junk Mail Crafts article on Squidoo. and to think I’ve just thrown those things away in the past. Seriously clever Walter! Love this and I think it should be in the next book. Now my mind is whirling with ideas, including how to use the inside of some of the envelopes! 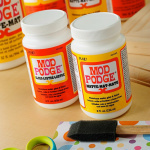 I received my copy of Mod Podge Rocks yesterday and it is delightful! I can’t wait to play. Gladd you like the book! Thanks billiejo! !